Saturday, Feb. 9 Wine Tasting – Stop in tomorrow from 2-4 pm to taste Spanish Tempranillo wines. 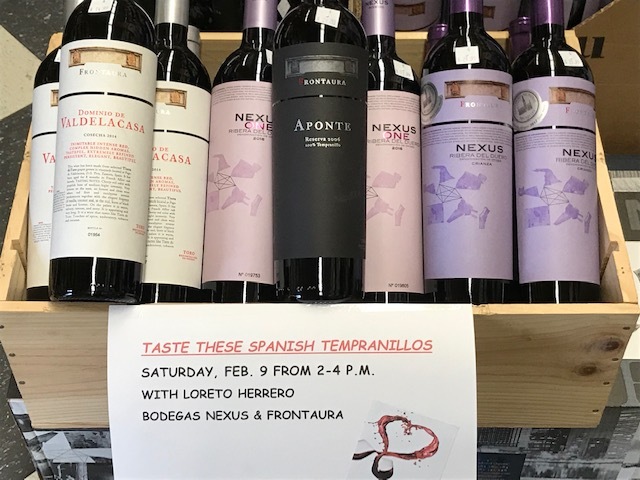 Gracious Loreto Herrero from Bodegas Nexus and Frontaura will be here to talk about their wines and pour samples. With wineries in two Spanish D.O.s (Ribera del Duero and Toro), the wines are all 100% Tempranillo, but show intriguing variations due to terruñyo. These are hearty and elegant wines, nicely warming on cold nights and excellent with lamb, duck or other meat dishes. In the unlikely event that snow forces us to cancel the tasting, or to close early today, we will post a notice on our Facebook site and our website’s contact page. 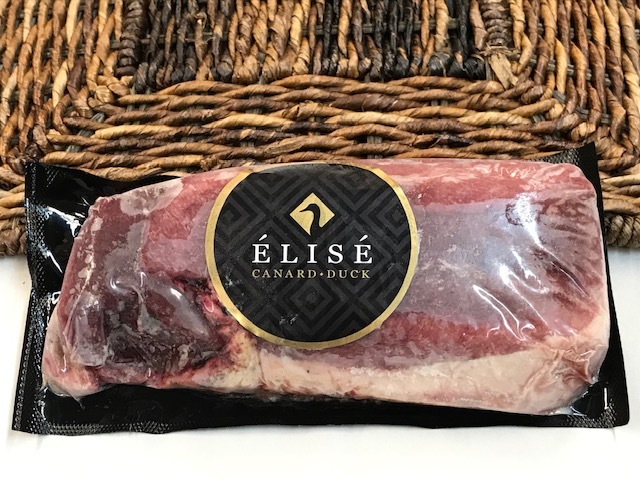 We now carry Élisé Moulard Duck Breasts in our freezer case. Weighing approximately one pound each, enough to serve two people, they would make a stellar Valentine’s Day dinner. (See recipe below). Crimson in color with a bold flavor and meaty texture, Moulard duck is sometimes called “the other red meat.” The breed most prized in France, Moulard ducks are de rigueur for classical French cuisine — duck confit and duck á l’orange, for example — and thus pair well with traditional flavors from mustard and mushrooms to wine, vinegar, and figs. A hybrid offspring of Pekin and Muscovy ducks, Moulards have a thick fat cover and larger cuts compared to Pekin. Moulard ducks are sometimes called Magret. 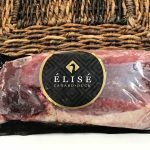 In French, this term refers only to the breasts (more specifically, breasts from Moulard ducks raised specifically for foie gras production). These Moulard ducks are humanely raised in Quebec, Canada. The farmer-owners spent time in France learning the traditional way of feeding ducks to produce foie, and use all-natural vegetarian feed and no antibiotics or hormones. These breasts are from the same Moulard ducks raised for foie gras. We also carry foie gras, frozen or canned. 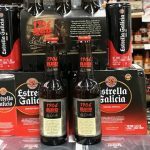 Estrella Galicia beer is back in stock. 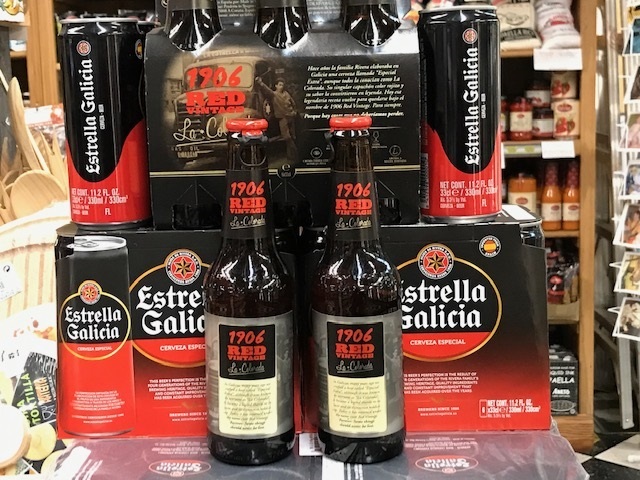 We now carry the flagship Pilsner-style lager in cans, and 1906 Red Vintage “La colorada” a historic recipe revived from the brewery’s past. La colorada is an intense amber lager, with a delightful caramel & roasted malt profile, subtle hop bitterness & slight warming finish. French sweets: We carry many excellent chocolate bars, cookies and the irresistible rabitos (figs stuffed with chocolate-brandy ganache, coated in dark chocolate) from Spain and France. For a special Valentine’s Day treat, consider getting a Valrhona chocolate Lava cake from France. Heat briefly in the oven and savor the the hedonistic and oozing chocolate center. It’s a death by chocolate moment. Or, for a more simple sweet, get an assortment of our Macarons, baked, packaged and frozen in France. They thaw in about 30 minutes with a soft and freshly-baked flavor. Formidable! If using fresh chanterelles, clean them, then blanch in salted boiling water for 2-3 seconds. Dip in cold water to stop the cooking. If using dried chanterelles, rehydrate by soaking in hot water for 30 minutes, then drain in a colander. Wrap in paper towels and refrigerate. About 1 hour before serving, remove the duck breast from the refrigerator, rinse and pat dry with paper towels. Trim the duck of excess fat. Wipe the flesh dry and score the skin in a crosshatch pattern without piercing the flesh. Sprinkle the fat side generously with salt and half the pepper. Cover loosely with plastic wrap. Set a large nonstick skillet over medium-high heat, add 1 teaspoon of the butter and the duck breast, flesh side down, and sear well, about 2 minutes. Add 2 tablespoons stock to deglaze the skillet and boil until thick. Turn the duck over; season with salt and pepper. Reduce the heat to medium-low and slowly cook the duck breast, fat side down, without turning, for 15 minutes. Meanwhile, in a large straight-sided skillet set over medium-high heat, sear the chanterelles for about 30 seconds, until you hear them squeak. Add the apricots, shallots and remaining butter and cook, stirring for 2 minutes. Add half the stock and simmer until the mushrooms are just tender, about 5 minutes. Remove from the heat. Turn the duck breast over and finish cooking on the flesh side. To test for doneness, use your thumb and middle finger to pinch the flesh. If it springs back quickly, it is rare. Remove to a side dish, cover with foil and allow to rest for at least 5 minutes while the juices settle. Pour off all the fat from the skillet. Deglaze with the remaining stock. Scrape the mushrooms into the pan and bring to a boil. Heighten the flavor with lemon juice and correct the seasoning. Fold in the almonds and chives. To serve, thinly slice the breast and fan out the slices on a warmed serving platter. Season lightly with salt and pepper. Serve with mushroom sauce.